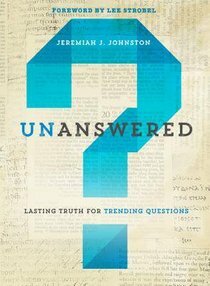 About "Unanswered: Lasting Truth For Trending Questions"
Jeremiah J. Johnston, is a New Testament scholar and frequent contributor to national publications and shows, including USA Today, Relevant, The Christian Post, Fox News, and In the Market with Janet Parshall. A sought-after speaker by universities and churches of various denominations, Johnston ministers internationally in partnership with the Museum of the Bible and is president of the Christian Thinkers Society, a resident institute at Houston Baptist University, where he serves as professor of early Christianity. He is the author of Unanswered: Lasting Truth for Trending Questions and has developed and taught Bible study video series with LifeWay Church Resources. Johnston and his family live in Houston.